Homelessness Week is an annual week coordinated by Homelessness Australia (HA). It is used to raise awareness of people experiencing homelessness and the everyday issues they face. It is held in the first full week of August every year, taking place this year on the 7th – 13th of August. 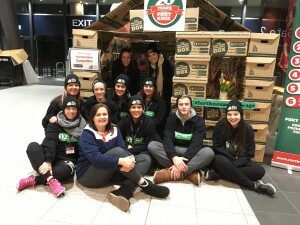 Each year Fort Knox works together with Melbourne City Mission to help raise awareness for youth homelessness by participating in the Sleep at the G event. In Victoria alone, more than 7,000 young people are experiencing homelessness, Melbourne City Mission is doing an excellent job at trying to tackle this. Including youth, there are currently 105,237 people in Australia who are homeless, which means on any given night 1 in 200 people are homeless. HA has revealed that there has been a 60% increase in the number of people sleeping in their cars and 46% increase in couch surfers. As a family owned business we take great pride in our community support and believe that each person deserves to have a warm and safe place to sleep. We are honoured to work with such a great cause and bring awareness to disadvantaged people within our community. In commemoration to the people who have died on our streets, various churches and missions began running winter vigils in August as this is generally the coldest time of the year and when people were likely to be overcome by the elements. With more organisations and become involved every year, in 2007 Homelessness Australia began coordinating this week of winter vigils in August as National Awareness Week. To get involved with Homelessness Australia and help make a change contact them here to work alongside Melbourne City Mission and help combat youth homelessness contact them here. Fort Knox Creating A Brighter Future With Solar!